The EU Commission just warned Sierra Leone with a “yellow card” after considering the country’s level of development and engagement against Illegal, Unreported and Unregulated fishing (IUU) to be inadequate. This formal notice, based on the EU IUU Regulation (Council Regulation (EC) No 1005/2008), should encourage the country to take immediate actions or it will risk to be banned from exporting fish to the EU. According to the EU Commission, "in Sierra Leone legal texts governing fisheries are outdated and sanctions fail to deter illegal operators operating internationally under the flag of Sierra Leone, without the fisheries authorities' knowledge. In addition, the number of licensed vessels exceeds the available resources and authorities fail to monitor or control their waters." Small-scale artisanal fishing is critical to Sierra Leone. It directly or indirectly employs around 230,000 people, and accounts for between 65% and 80% of animal protein consumed in the country. Women in particular rely on fish as a key source of income by running fish smoking co-operatives and taking the fish to market. Sierra Leone’s own fisheries ministry (MFMR) estimates that the country loses approximately US $29 million per year due to IUU fishing activities. 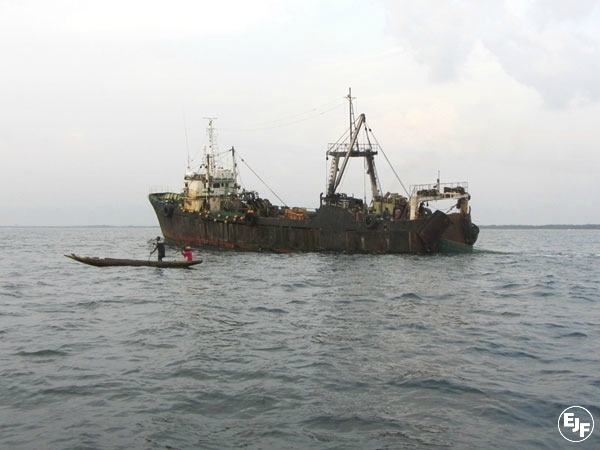 A significant proportion of these losses stem from the activities of foreign trawlers operating illegally in Sierra Leone’s Inshore Exclusion Zone (IEZ), an area strictly reserved for artisanal fishermen and as a breeding and nursery ground for fish. “For a country so dependent on fish, it is critical that Sierra Leone recognizes the importance of combatting IUU fishing. We call on the recently appointed Minister of Fisheries and Marine Resources, Ms. Elizabeth Mans and the Government of President Koroma to act urgently to combat IUU in their waters, weed out corruption and ensure the maximum benefit from this extremely valuable resource accrues to the people of Sierra Leone. EJF offers its full support to help achieve a legal, sustainable and well-managed fishery sector in Sierra Leone”. The Commission now plans to enter into a more formal dialogue with the authorities of Sierra Leone and will propose a formal Action Plan to address the problem. “EJF applauds the on-going leadership by the EU Commission in combatting IUU fishing globally”, adds Steve Trent. Across the world, other States like Spain, Korea or Sri Lanka have responded to yellow cards with essential reforms that have helped make IUU fishing more difficult and less profitable. Global losses from IUU fishing are estimated to be between $10 and $23.5 billion per year. Between 11 and 26 million tonnes of fish are caught illegally a year, which corresponds to at least 15% of world catches. The third-country carding process is an important component of the EU IUU Regulation and is used as a tool ensuring that countries which export fish to the EU, or who lend their flags to vessels that are involved in the EU supply chain, cooperate in the fight against IUU fishing. Countries identified as having inadequate measures in place to ensure catch is legal may be issued with a formal warning (yellow card) to improve. If they fail to do so, they face having their fish banned from the EU market (red card). On making required improvements, they are delisted (green card). On the 21st of April, EU warned Kiribati, Sierra Leone and Trinidad & Tobago with yellow cards as they risk being uncooperative in the fight against illegal fishing. Sri Lanka was delisted after reforming its fisheries system. The Environmental Justice Foundation (EJF) is a UK-based non-profit organization working internationally to protect the environment and defend human rights. EJF believes environmental security is a human right. EJF has been operating in Sierra Leone since 2008. We have been documenting illegal trawlers, engaging local communities and undertaking medical emergency missions. EJF’s work aims to be direct and effective, drawing from investigations, field projects and community partnerships to create targeted policy briefings and reports, campaigns films and international advocacy that reach the highest level of policy making in government, business and amongst the public. EJF was founded in 2000 by Steve Trent and Juliette Williams who remain the charity’s Directors, and who today work with an international team based in the UK, Spain, Germany, Cote d’Ivoire, Ghana, Liberia and Serra Leone. Our work is guided by a UK Board of Trustees and supported by our patrons who help our campaigns to reach new international audiences.